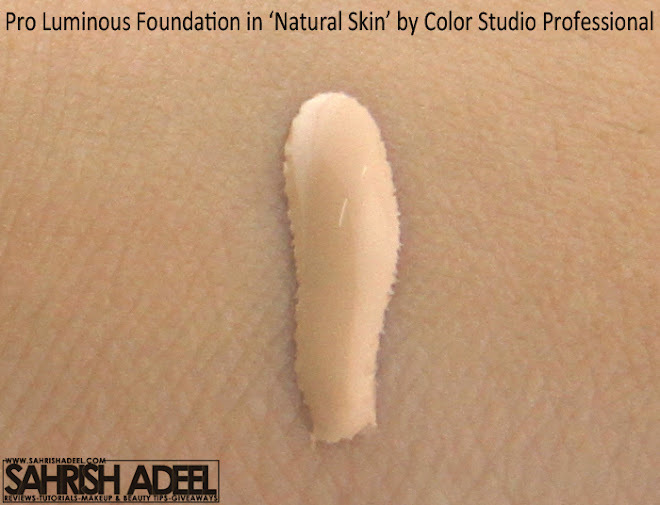 Pro Luminous Foundation in 'Natural Skin' by Color Studio Professional - Review & Swatch | Sahrish Adeel - Malaysia based Pakistani Beauty & Lifestyle Blogger! Finding your perfect shade in foundation can be tricky but finding a-perfect-foundation is hard and sometimes close to impossible. But since 'impossible' says i-m-possible, I will show you something you will love for sure. 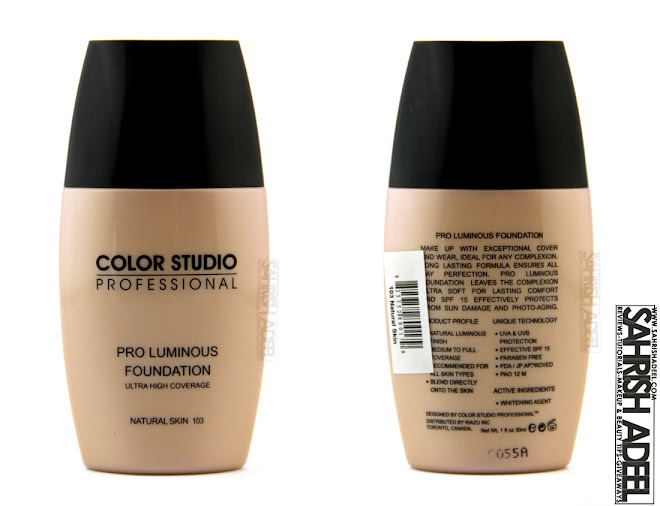 Pro Luminous Foundation comes in a squeezable plastic bottle with nozzle. It contains 30ml of product and this liquid foundation comes in four shades. The one I am reviewing is in shade Natural Skin and has a neutral undertone. The texture of this foundation is watery but not runny. Nozzle with squeezable bottle makes it hygienic & mess free to use. Stays on for good five hours in hot & humid weather without powder. Does not streak or slide. Covers up redness, slight dark circles & discoloration. Blends easily with fingers, sponge or a foundation brush. Suitable for all skin types since it is water based. Comes only in four shades & packaging should be improved as it does not do the justice to the amazing quality of the product. For me a foundation for daily routine use has to be perfect or it will just sit on my makeup table forever. Since I have very oily skin, my skin starts to shine really early in like three to four hours as I live in a hot and humid weather. I tried Pro Luminous Foundation and at first I thought it is just OK for coverage and the shade looked a bit whitish as well. I wore it again the next day and I had to change my views. I applied only this foundation with my fingers (two layers), put on some blush, mascara & a lip gloss and I went out for about 3-4 hours. I kept checking the foundation and I saw some shine only on my nose after three hours which was not bad at all because I was sweating before that and also, I did not apply any powder over the foundation. It stayed for about five to six hours before starting to tone down. If a powder is applied over the foundation, it improves the staying power & the coverage while keeping the skin breathable. Since I have really oily skin, my foundation slides sometimes if I sweat too much but this one did not give me any trouble. Talking about the shade, when I apply it, it looks a bit whitish and then it oxidizes a bit. Since it has neutral undertones, the oxidization makes it match my natural skin tone and makes a nice match. Overall, I am really impressed with this foundation. But the shade range is too small and the packaging needs to be a bit improved. Not the bottle shape, it is so cute but the quality. This is a water based foundation so it is suitable for every skin type but people with dry to normal skin types might need moisturize or primer the face prior to the application. If you can find you match in this foundation, I would say that you should get it right away. The amount and quality of the product for this price is really great. 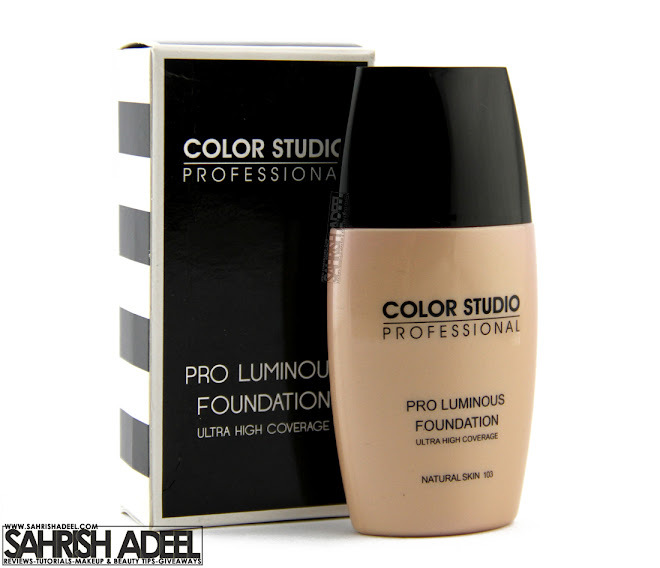 Pro Luminous Foundation costs PKR 750. This product is available all over Pakistan in almost all big super stores. If you want to buy it online, you can get it from Just4Girls.pk & BeautyArena.pk. You can also join Color Studio Professional's Facebook page here. Have you tried Color Studio Pro's Foundation yet? Check out more reviews on Foundations here.